Thankfully, in the way that we like to indulge in our pleasure of smoking, we have the choice of tobacco free products, or for those that prefer, they can choose traditional products normally associated with tobacco. Increasingly, more smokers are turning to herbal products and it makes sense that when rolling a herbal smoke, the use of a tobacco free wrap will not detract from the taste of the herbal product. 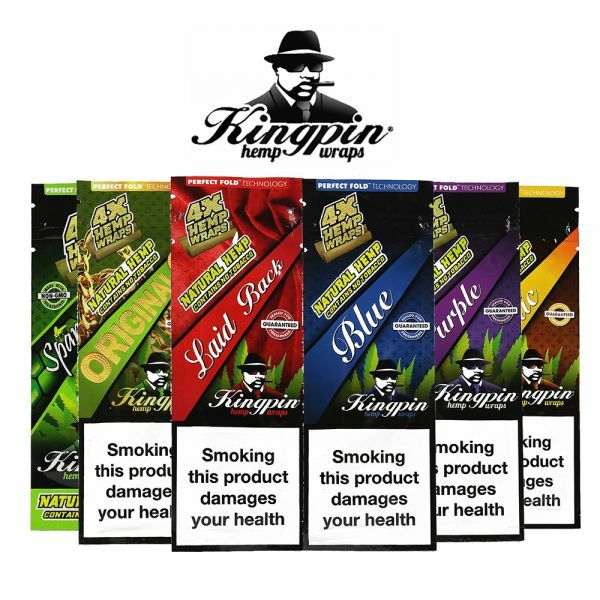 A recent addition to our product range is the Kingpin Tobacco Free Wraps which are offered in six new and exciting flavours. Manic Mango, Goomba Grape, Blueberry Bomb, Laid Back, Spanish Fly and the Original G flavour. Users tell us that these new wraps enhance the pleasure of smoking, made being entirely from 100% natural fibres they smoke better than the tobacco wraps, plus they give the user a better delicious taste! Each pack contains 4 wraps in a resealable packet, so easy to ensure that the flavour is not contaminated and ready for use whenever you’re ready. They have a great feel when wrapping your herb and due to the clever fold technology even someone who is “all fingers and thumbs” will have no difficulty ensuring that the warp is folded in place perfectly. Currently we are offering these at just £1.50 each, but if you choose to buy all five flavours, or five of the same flavour, or any combination, we will throw in an extra one free. V12 Plus Twisty Blunt – a new way to smoke! It’s been a while since we’ve had a new product come in that genuinely gets us excited and really offers a new experience for smokers. We are talking about the V12 Plus Twisty Blunt which could revolutionise the way we smoke. This uniquely designed blunt is used by loading the pipe with tobacco, once it is lit simply twist to get rid of the ash. The main body of the V12 Plus Twisty Blunt is constructed from borosilicate glass and also features a full metal twist mechanism in the middle, meaning that it’s built to last. It is easy to fill by removing the rubber cap and loading your tobacco while twisting the mouthpiece to the desired fullness. Then simply light it like a normal blunt and once the ash starts to form twist the mouthpiece to clear it away. The V12 Plus Twisty Blunt can also be used as a bong bowl and will fit all bongs with a 18.8mm joint. Included in the package is a spare o ring and a cleaning brush to keep the blunt in good working order. Order now for just £26.99! The original blunt, of course, was made with the tobacco leaf from cheap cigars, if there was ever such a thing as a cheap cigar of course, but not then it was not the big Havana Orson Welles type, no it was likely to be the cigarillo style; today it is normally found pre- made for users to roll their own cigarettes using papers or wraps. With the increasing popularity of herbal tobacco free products, many look for a wrap not made from tobacco instead and increasingly we find that many prefer one which is tobacco free in order that their herbal mixture is not contaminated. We offer a really cool alternative to the normal regular wraps and these can be supplied in four flavours, choose from Mango Tango, Goomba Grape, Blueberry Bomb, or Spanish Fly. Each pack contains four wraps, made from 100% natural hemp fibres, these are a real must have, they offer a very desirable smoke, which we believe you will quickly find so much better than tobacco made papers or wraps; they also give you a deliciously mellow taste! 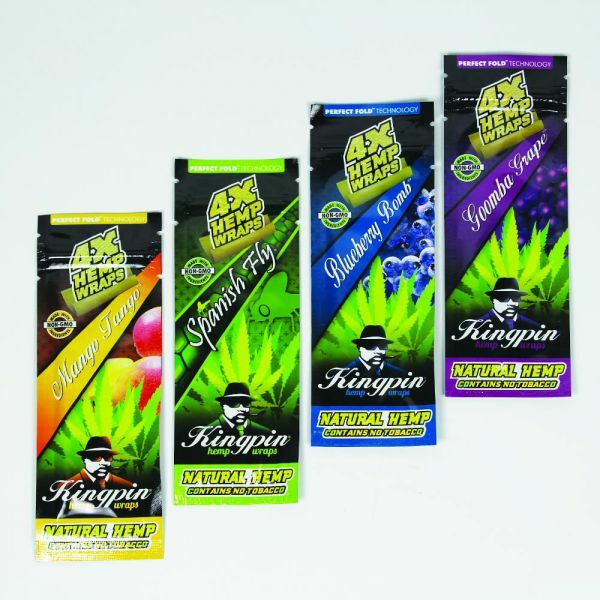 With four flavourful wraps offered at just £1.50 a pack, Kingpin Tobacco Free Wraps are a must have smoking accessory for the connoisseur smoker who knows. We have come to expect a lot from Cyclone Blunt Cones since they first came to the attention of smokers in 20013. The original blunts were an immediate success, something that the discerning smoker had not experienced previously. The clever innovative shape of the pre-rolled cones, made it easy for smokers to fill the cone with their favourite smoking mix, every draw good from the first to the very last. Now after close to fourteen years of innovation, Cyclone have produced a blunt which burns at a much slower rate, thanks to the double layer of the top quality tobacco leaves, add to that the bamboo tips which have been soaked for seven days with one of the exciting flavours now on offer, we are sure that you will agree that the experience is both intense, sweet as well as satisfying. When you receive the Xtra Slo Cyclone Blunt from us, you will see that it is protected in a tough plastic tube, when you have filled the Blunt, you can use the tube to store your smoke, go about your normal day and take it out for a smoke, replacing it when finished just as often as you wish. We offer the Xtra Slo Cyclone Blunts in a variety of flavours, check out our web pages to make your choice, they come in packets of 1 single cone, with the exception of Mayhem, Wolverine and Wonderberry, and these are supplied in packets of two. Choose your favourite mouth-watering flavour and join in with the growing numbers of smokes enjoying the new slow burning blunts from Cyclone. Since they first appeared thirteen years ago, Cyclone Blunt Cones have been one of the most popular pre-rolled smoking cones available to buy. Using a ground breaking pre-rolled cone shape, the last draw on this is as good as the first one. Traditionally the cones are made from tobacco leaves so you can fill them with the smoking blend that you prefer. Whilst these have been immensely popular, there is another option that you may wish to consider, Cyclone Clear Blunt Cones. These are tobacco free, but are offered in 9 exciting flavours including natural allowing you to just enjoy the flavour of your favourite smoking mix, or if you prefer, one with a flavour such as blueberry or cherry. The Cyclone Clear Blunts are sent to you in a handy tough plastic tube, this allows you to fill it with the mixture of your choice, stored back in the tube to keep it safe from being crushed if carried about with you. You can also smoke it as and when you wish, replace it into the tube if not completely smoked and light up again when you take another smoke break. Check out our web page for the eight flavoured blunt cones and in case anyone is wondering if the cones are made from plastic, they are not, they are made from cotton cellulose, glycerine, and water. We have all experienced the fact that the first half of the cigar or blunt tastes better than the second half, especially near the end. The reason this happens is that as you smoke a blunt, the tobacco you are smoking passes through the unsmoked tobacco which is acting like a filter, the nearer the end the stronger and hotter it becomes. These clever cyclone blunts have overcome that by simply designing the tube to be just what it says; a cyclone shaped tobacco container. When the Cyclone burns, more tobacco is burning at the beginning, as the tobacco is being burned it becomes stronger, but because of the shape of the tube, you are smoking less and less of it, this means that the first puff tastes almost the same as the final puff. You are experiencing the most even flavour and smoking experience possible. The Xtra slo Cyclone Blunts are they double wrapped in the finest tobacco leaves, they also have bamboo tips that have been soaked in flavour for seven days, and you will get the finest smoking experience which is guaranteed to be intense. Choose from a number of flavours, six in all and give your taste buds a real treat. Cyclone’s trademark bamboo tips, known as “Dank 7” tips, are left to soak up sweet flavours over seven days. The tobacco leaves, which are double wrapped have also been dipped in flavour, you will never look back from this smoking experience. Have you tried a blunt? If you haven’t tried a blunt you really should, we guarantee that you will enjoy a wonderful smoke, very similar to a cigar, but at a much more affordable price. In case you are unsure what a blunt or blunt wrap is, a blunt is essentially a cigar but in two distinct parts, an inner leaf which is usually tobacco and the outer leaf which is thicker and is spiralled around the inner leaf. We offer a huge variety of blunts at our web page, but which one is the one for you? Well we suggest that you look at the double platinum range, here the tobacco wraps come in a wide range of flavours so you can get a different taste every time if you want to. Start with the single range; here you will be able to try several different flavours. For example, you can choose from exciting flavours such as chocolate, piña colada, cognac, wild honey, peach passion and watermelon, among many others. Our 25 double packs is good value as with this you get a box of 25 double packs giving you 50 blunts when you order a box. Try the mixed bag which lets you try several different flavours, again a box of 25 double packs means that you get the value of 50 blunts but this will be in a variety of flavours, so you get to try several flavours and you can then decide which is your favourite. We can be sure that after trying our platinum blunts, you will have a new and different smoking experience. Our price also means that your bank balance will not have a huge hole in it either. Double Platinum Blunts – for a taste sensation! Double Platinum Blunts are perfect for those who want something a bit different; they are available in over 20 flavours including bubblegum, chocolate, French vanilla and cherry, and each pack contains not one but two tasty blunts. Double Platinum Blunts are foil sealed for freshness and are slow burning meaning that you can experience the taste sensation for longer. Double Platinum Blunts are available now for just 99p each, or buy 5 and get one free (simply add 6 to your basket to take up the offer). Alternatively, for those who can’t decide which of the exciting flavours to buy you can purchase a mixed bag of 25 for just £19.99. Please note: All Double Platinum Blunts are 100% UK compliant and all duties have been paid. Like the look and taste of blunts, but want to roll your cigarettes to your own length? Then Brown Sugar Tobacco Rolls are for you. These tobacco rolls come in a range of tasty flavours including chocolate mint, cognac & honey, strawberry and cherry bonbon. Each roll comes in a handy plastic pack which not only keeps your paper safe but also keeps it fresh for when you need it. Each roll is approximately 6 feet long so it’ll last and at just £2.99 a pack is economical too. Please note: This product cannot be shipped to Canada or the United States. For those who prefer standard blunts, we have a huge range of blunts in a wide range of flavours to suit any smoker. Most blunt smokers will know that they often don’t have glue on the edge unlike rolling papers, instead using your saliva to hold them together. This can be frustrating especially if you don’t use enough saliva and the blunt starts unravelling once it’s lit. A great alternative to this is to use Juicy Rolling Glue, which eliminates you having to use your own saliva and creates a more durable and secure smoke. Juicy Rolling Glue is also a handy product to have if your blunt start to unravel after its been lit and saves you from burning your tongue. Juicy Rolling Glue is also great for those who like to roll a few blunts before they go out as the glue will keep everything safe and secure. Juicy Rolling Glue is 100% natural and is made from quality plant cellulose; these little pots are available now for 60p each and are invaluable for any blunt smoker.